Adding a crystal or bead at the bottom of a simple pair of chain maille earrings is one easy way of adding a bit of color to the design. 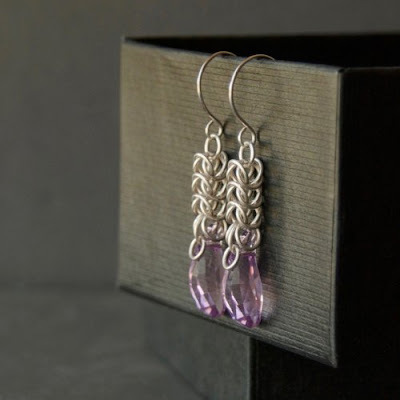 I like this box chain maille and crystal earrings tutorial by Kylie Jones for a couple of reasons. Firstly, box chain - which is a simpler Byzantine modification - is easy to do. One which beginners can tackle. Secondly, the crystal is a side-drilled one. So a larger jump ring had to be used to attach to the chain maille dangle. This designer also hung smaller jump rings on either side of the top of the crystal. It is a small detail but still a neat one because these rings not only add visual interest but also hide the side drilled holes. Where is the tutorial? I can't find it. Thanks for letting me know! I forgot the link! Post has been updated with it! Nope. It was me who forgot the link. Please check the post again and you will find it. My apologies.